Welcome back to our mini series about colour. Last time we were talking about purple, and this month let’s look at orange. Not the easiest of colours to love, but with the Living Coral, a peachy orange shade, becoming the Pantone Colour of 2019, interior and fashion bloggers are all over it. Find out more about how to include orange and its trendy hue Living Coral in your life, interiors, fashion and business. 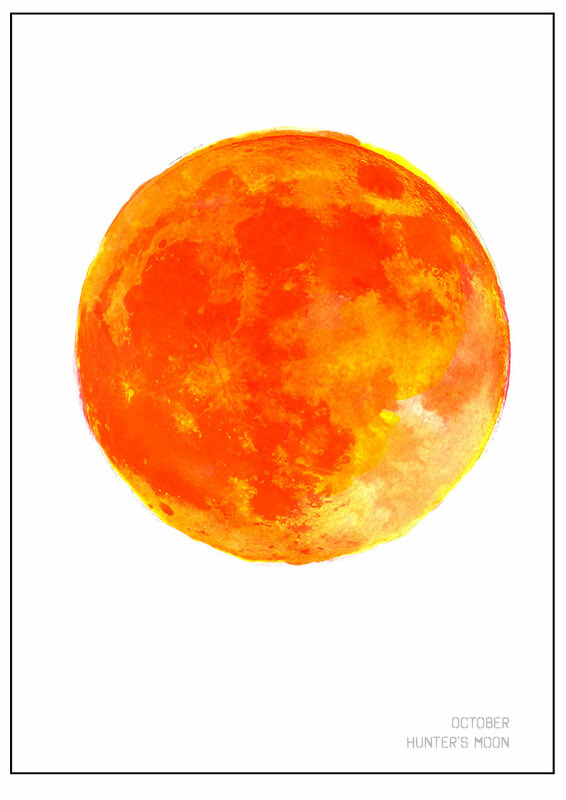 Orange represents happiness and sunshine (just like yellow), and, thanks to the influence of red, it has energy and drive. ‘The Secret Lives of Colour’ quotes Wassily Kandinsky, the Russian abstract artist, who described orange as a man, convinced of his own powers. Orange is confident and positive. It makes us spontaneous, enthusiastic and sociable. It gives us hope and, as it’s eye-catching, serves as a perfect warning of a potential danger. According to Kate Watson-Smyth, orange can also be perceived as frivolous and gives the impression that things are not being taken seriously, so it might be ok in a kids play room but not in a meeting room where you are trying to impress. “Just the summer in general, summer holidays, the beach. Orangina in those old glass bottles, and Calypso lolly pops. It’s a very nostalgic colour.” Amy Exton, Set and Interior Designer and Owner of Margate Location House. “Sociable and spirited, the engaging nature of Pantone 16-1546 Living Coral welcomes and encourages light-hearted activity,” said the company. In interiors, orange is a difficult colour to get right. In the 70s, it was omnipresent in pretty much every British home, but nowadays, not many people dare to venture into its territory. Orange is great as an accent colour, but probably should be avoided, if you wish to create a relaxing ambience. Perhaps reserve it to a smaller area, if you are not brave enough. 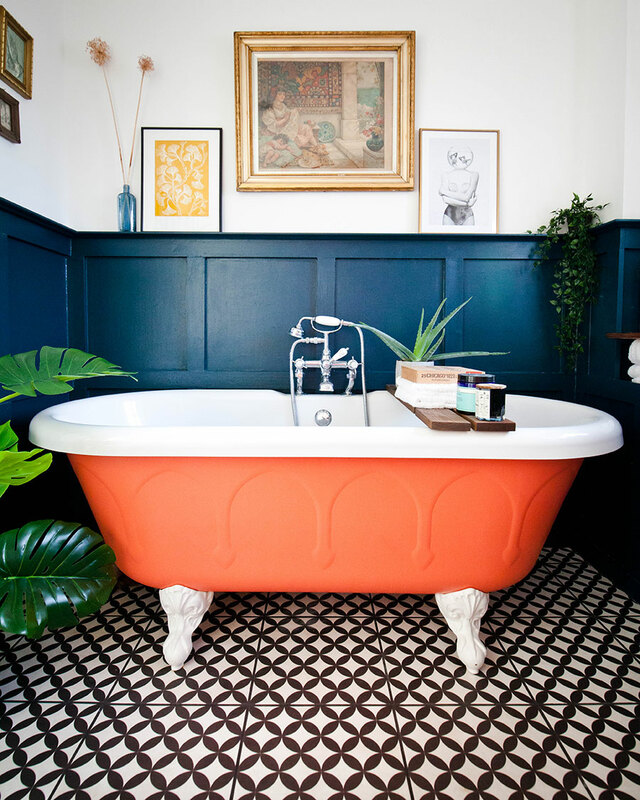 One of my favourite images spotted on Instagram, is the orange bath paired with a dark panelling and a geometric floor. 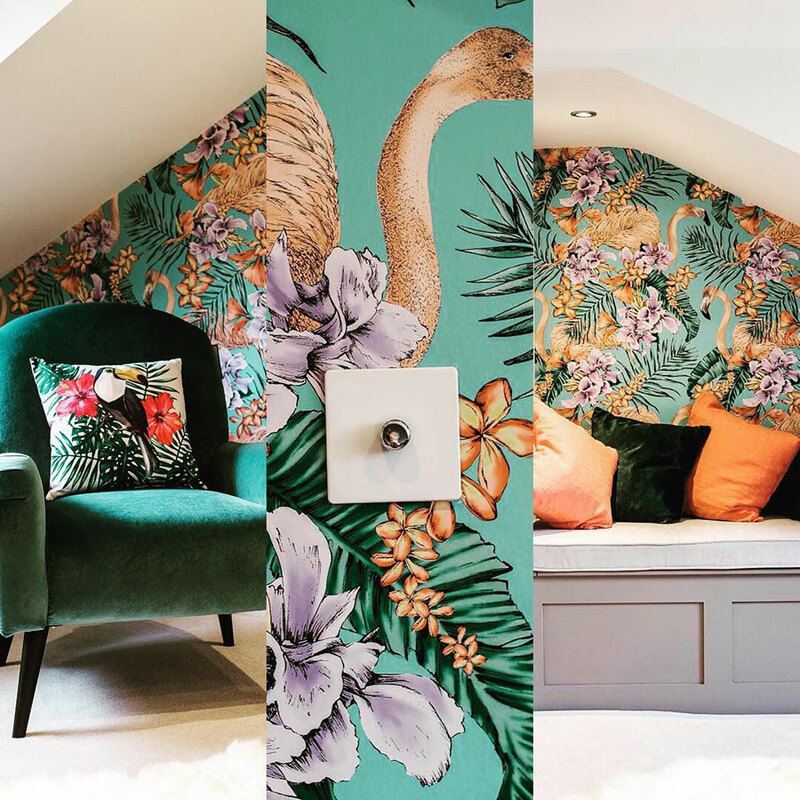 Lissi @Oxfordone, an Interior Design Blogger, a co-host of colourmyhome Instagram challenge, has been brave enough to incorporate orange into her bathroom making it playful and contemporary. Pantone 16-1546 Living Coral embodies our desire for playful expression. Let’s look at two examples of using the coral hue that caught my attention. 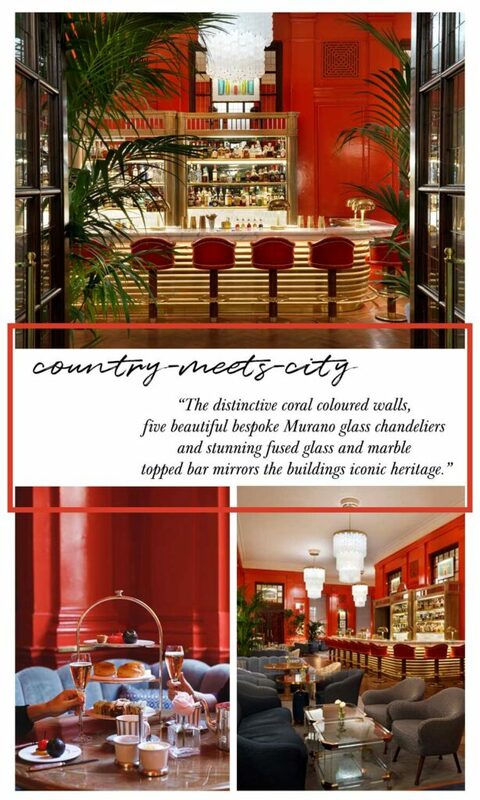 The Coral Room, set in the heart of Bloomsbury, is a grand salon bar reflective of an exquisite country house transported to the city, with a secluded cigar terrace, inimitable cocktail list and an extensive English sparkling wine list. The vibrant bar inspired by a ‘country-meets-city’ concept, evokes the collaborative Martin Brudnizki interior design. 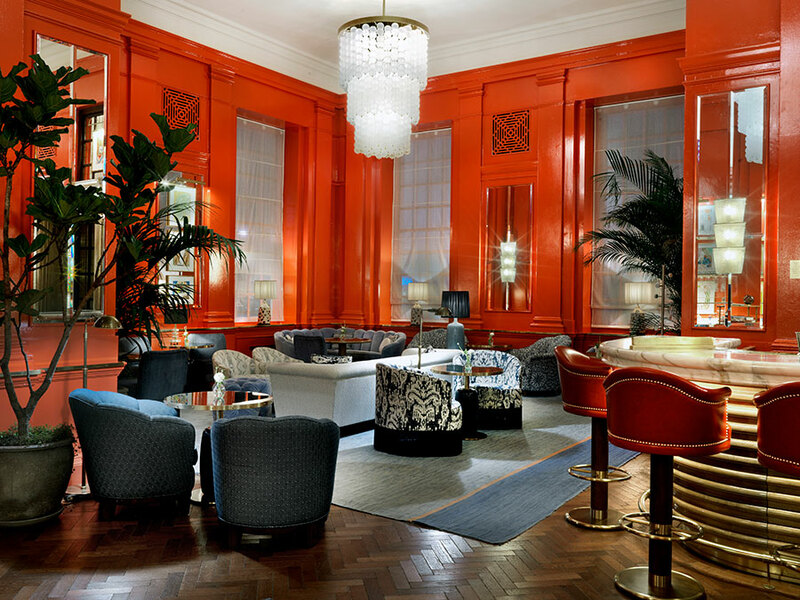 Housed within The Bloomsbury hotel – a Sir Edwin Lutyens, Grade-II listed building on Great Russell Street in London – the distinctive coral coloured walls, five beautiful bespoke Murano glass chandeliers and stunning fused glass and marble topped bar mirrors the buildings iconic heritage. What’s more, acclaimed British illustrator Luke Edward Hall has created 36 bespoke pieces of original art to line the coral walls inspired by the ever-evolving Bloomsbury area. In contrast, the traditional panelling and natural materials allow guests to be transported to a relaxing country escape without leaving the city. Our second example is Margate Location House, a three-storey period property in a converted hospital, right in the heart of Cliftonville, Margate. Designed and curated by set and interior designer Amy Exton in her signature acid-aesthetic. 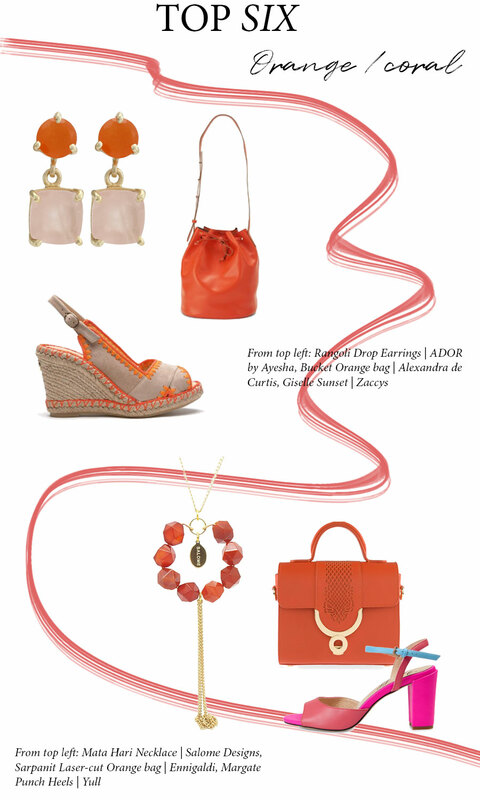 “I love coral because if it’s the right shade, it has a glowing quality, like it’s slightly neon. My living room is coral at the moments, and it’s makes the room feel so cosy and warm.” Amy Exton, Set and Interior Designer and Owner of Margate Location House. Orange and blue are complementary colours, so they tend to produce a really striking effect. I really like dark shades of orange combined with Electric Blue. Also, coral and blue are a perfect pair, don’t you think? 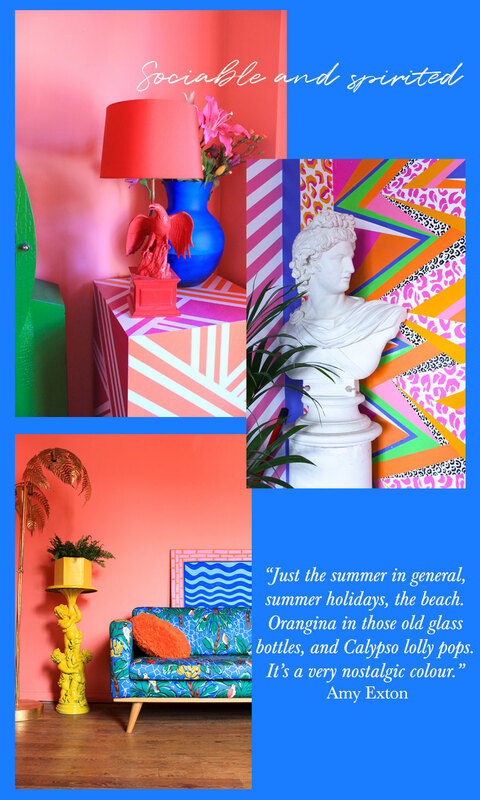 Don’t be afraid to mix orange with pink for a funky and refreshing take on interiors. Orange, yellow and lime sit side by side on the colour wheel, so you can create a stylish harmonious look. Read more on Sophie Robinson’s blog. There are many shades of orange, but my old-time favourites are: Citrus and Tangerine, and, of course, Coral. Try to use the colour wheel if you are struggling to combine different hues and would like to become a bit more adventures with your wardrobe. Perhaps, don’t use it if you want to be perceived as a high quality brand. Orange is frequently used in advertising, as it’s attention grabbing but not aggravating. Overall, orange is a positive colour, so why not include it in your life? Written by Monika Pick, cover image kindly provided by The Coral Room. Kassia St Clair, The Secret Lives of Colour, John Murrray Hachette UK, London, 2018.